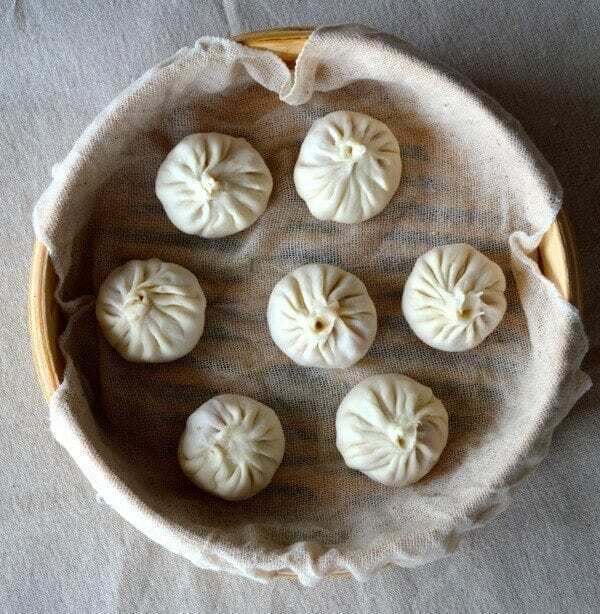 Shanghai Soup Dumplings, or xiaolongbao (小笼包)—perhaps the most perfect single bite of food ever conceived by man—does not require much introduction. 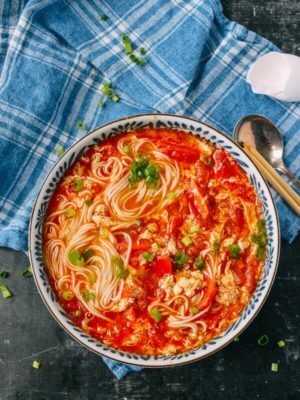 This tantalizing, dreamy snack is probably the most famous dish to come out of Shanghai: paper-thin skin enveloping perfectly seasoned pork filling and rivers of hot, flavorful soup. If the closest you’ve ever been to trying xiaolongbao was watching Anthony Bourdain slurping up hot soup so eagerly that he burned his mouth on national television, then the good news is: you can make Shanghai soup dumplings at home! Now, this was not an easy recipe to develop. 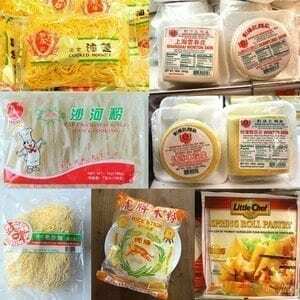 Having eaten these in restaurants in Beijing, Shanghai, and around the world, our standards are high. We tested and tried many versions in order to get each element correct, from the dough to the filling, to the soup. 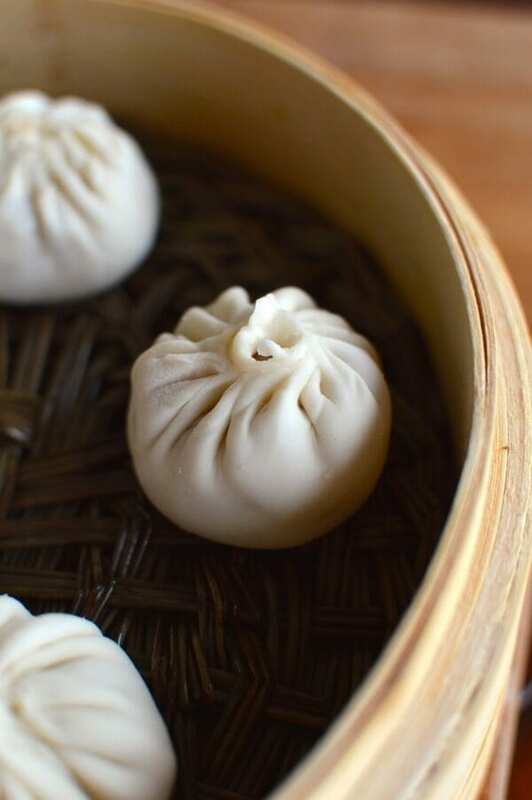 Now, every time we walk into a xiaolongbao restaurant, we’re amazed by the speed and ease with which those cooks prepare these delicate Shanghai soup dumplings or literally, tang bao. But I’m so excited about this recipe—excited to be able to share it with everyone. 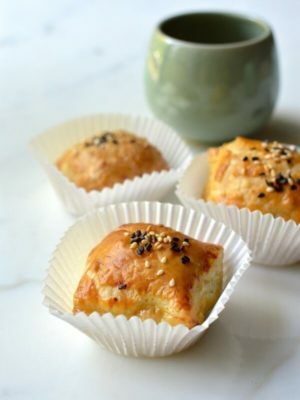 It’s a family favorite (Sarah has a particular obsession with them), and well worth a little patience in the kitchen. 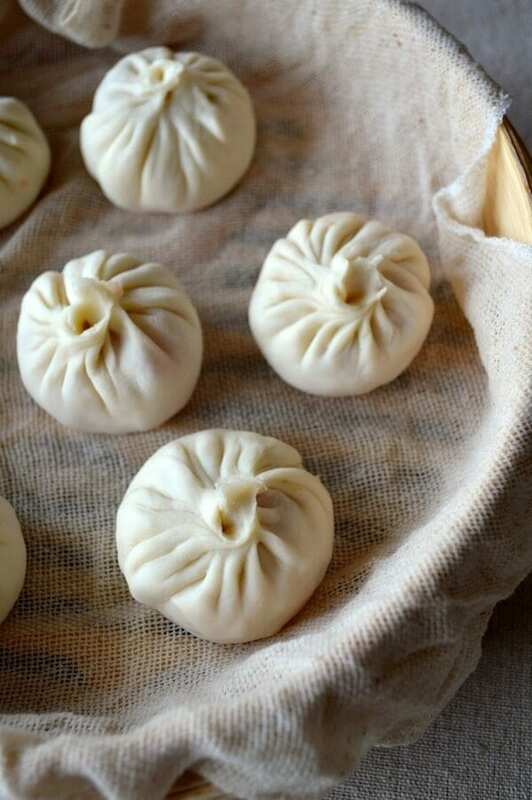 I still feel I have so much to tell you about these Shanghai soup dumplings or buns as they are called in Chinese—the flavor and the experience. But as Confucius said, “I hear and I forget; I see and I remember; I do and I understand.” I will let you come to your own conclusions about these. 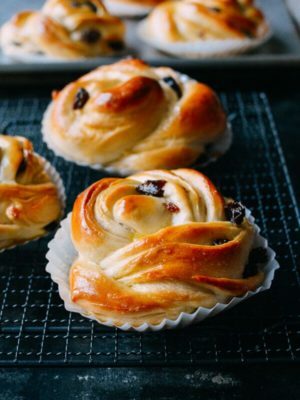 Follow the recipe’s steps as closely as possible, and you will be overjoyed with the result! 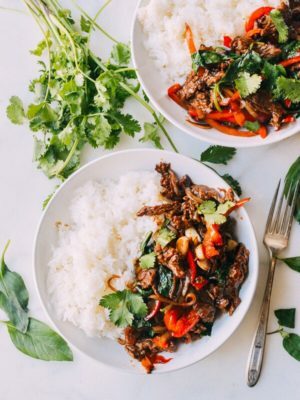 If you don’t have a bamboo steamer, try your Asian grocer or click here to get one on Amazon (note, this is an affiliate link, so any purchases from Amazon using this link will help support The Woks of Life!). 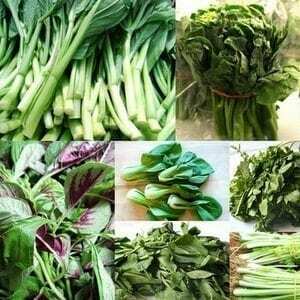 Other recipes where you will find the investment in the steamer basket useful is in our dim sum collection. 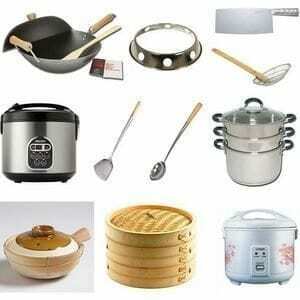 For other kitchen tools we use and recommend, look at our cooking tools page. So you must be wondering by now just how we manage to get hot soup into a dumpling. The answer: an aspic, or meat gelatin. You’ll make a pork soup with bones and skin (don’t freak out at this! 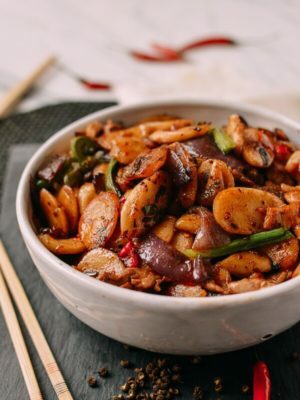 The Chinese—as well as all of the world’s great food cultures—have learned to utilize every part of an animal and leave nothing behind to waste! ), which will help you create a smooth, firm aspic once chilled. You can use the skin from a skin-on pork shoulder and buy pork neck bones or ham bones. If they’re not readily available in your local market, ask the butcher. In a small pot, add the pork skin and pork bones and cover with cold water. Bring to a rolling boil, and immediately drain and rinse off the bones and the skin. This gets rid of any impurities. Rinse out the pot and put everything back in. Add 4 cups of water, ginger, scallion and wine. Bring the pot to a boil and then reduce the heat to low. Cover and simmer for 2 hours. After 2 hours, turn off the heat, allow the soup to cool, and strain the liquid into a bowl. 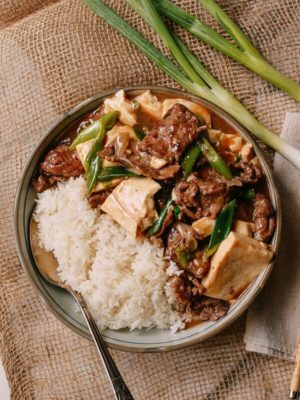 As to the leftovers in the pot, you can discard it or go the Chinese route, which would be to drizzle some light soy sauce over everything and start grazing). 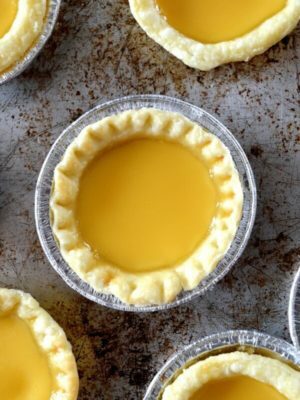 Once the liquid is completely cooled, cover and refrigerate overnight. This is what you’ll have the next day. Meat jello! In a mixing bowl, add the flour and the warm water 1 tablespoon at a time. 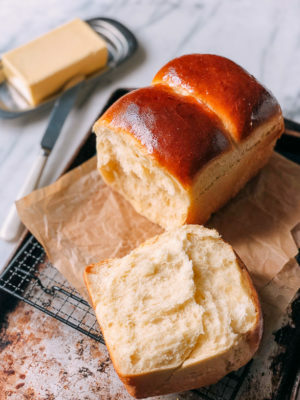 Work and knead the dough for 15-20 minutes. The dough should be very soft and smooth. Cover with a cloth and let it rest for 30 minutes. 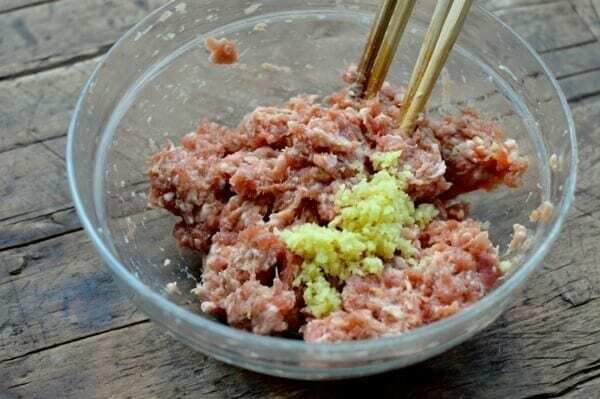 Take your ground pork and put it in the food processor. Pulse for 30-60 seconds until the pork resembles paste. In a mixing bowl, add the pork and all the rest of the ingredients except the aspic. Whip everything together thoroughly, for about 2 minutes. 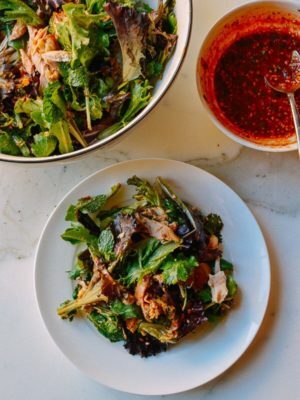 You want everything to be extremely well combined, and the pork should look like a light, airy paste. Gently fold in the aspic, and do not over-mix. Cover and transfer the filling to the refrigerator until ready to make the dumplings. 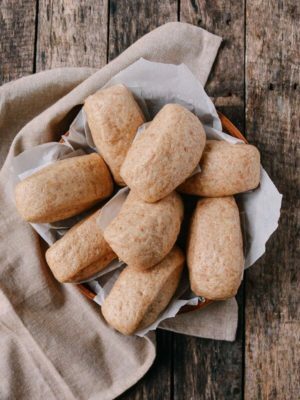 If you’re ready now, you can put it in the freezer for 15 minutes to allow it to firm up and make assembling the buns easier. Lightly dust a clean work surface with flour and roll the dough into a long cylinder/cigar, about an inch in diameter. Cut the dough into small equal pieces weighing about 11 grams each (the dough chunks should be a size resembling that of gnocchi). Roll out each piece into a round disc about 3 – 3 ¼ inches diameter. Keep everything under a damp cloth. …napa cabbage leaves, or these lovely bamboo steamer discs, which can be found in some Chinese restaurant supply stores (if using these, you must brush the discs with oil first!). When all that is prepared, take out the filling. 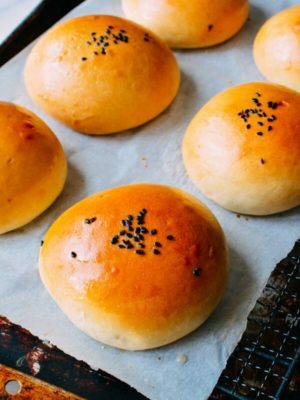 You’ll be making each bun one at a time. 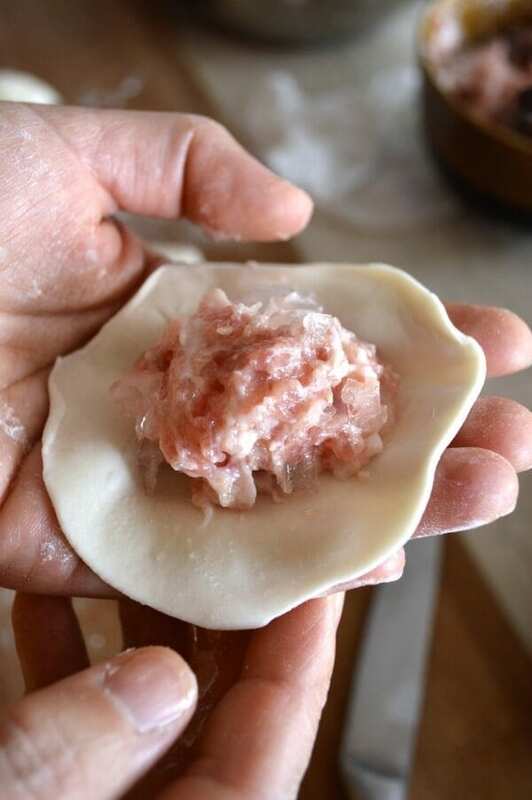 Place about 1 tablespoon of filling in the middle of your dumpling skin. Pleat the dumpling as shown in the video. It should have as many folds as you can muster: 12-20 folds should do it. Watch the video in our Carrot Ginger Pork Bun post. The technique is very similar. Basically, as you fold, you’re constantly using your thumb to push the filling into the resulting little “bag” that you’re creating with the dough. For this one, you’re just making more folds. Make sure the top is sealed. If the filling ever gets too wet or hard to handle, put it in the freezer for another 15 minutes and start again. 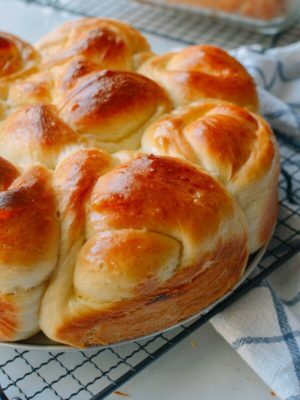 Place the buns in the lined steamer basket, about 1 1/2 – 2 inches apart. In a metal steamer pot or wok, boil water. If using a wok, put the water at a level so that when you put the bamboo steamer into the wok, the water rises about ½ inch up the bottom of the bamboo base. You never want the water to touch the dumplings inside, though, so make sure not to fill it too high! But make sure not to fill it too low either, because if all the water evaporates, you could end up burning your bamboo steamer. 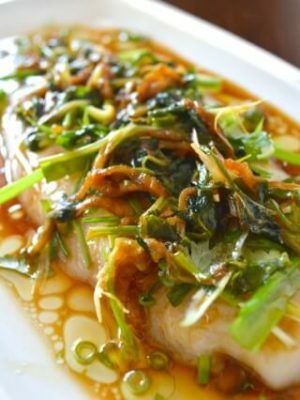 See our post on how to set up a steamer if you’re not familiar with steaming foods in Chinese cooking. Once the water is boiling, put the bamboo steamer in the wok or steamer pot, cover with the bamboo steamer lid, and steam over high heat for 8 minutes. Immediately remove the bamboo steamer from the pot and serve. Ok, so there is definitely a proper way to enjoy these dumplings. Put away the soy sauce because it has no place on the table right now. What you want is Chinese black vinegar. 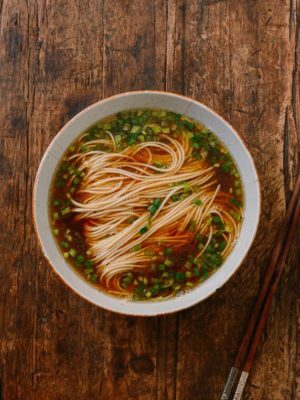 Pour some out into a small, round dish or bowl, and top with some very thin matchsticks of ginger. You can also dilute the vinegar with a tiny splash of water in order to make the flavor a little more delicate. 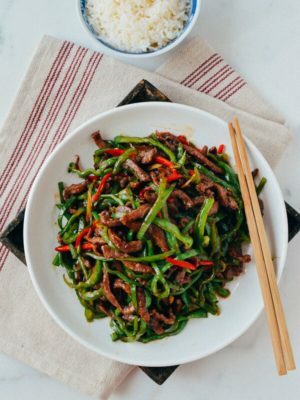 Take out your two utensils—chopsticks and a Chinese soup spoon (a fork would just butcher these and the soup would dribble out all over the table. It would be a tragedy of Shakespearean proportions). Carefully, slowly peel the xiaolongbao off of the steamer basket and dip it into the vinegar. 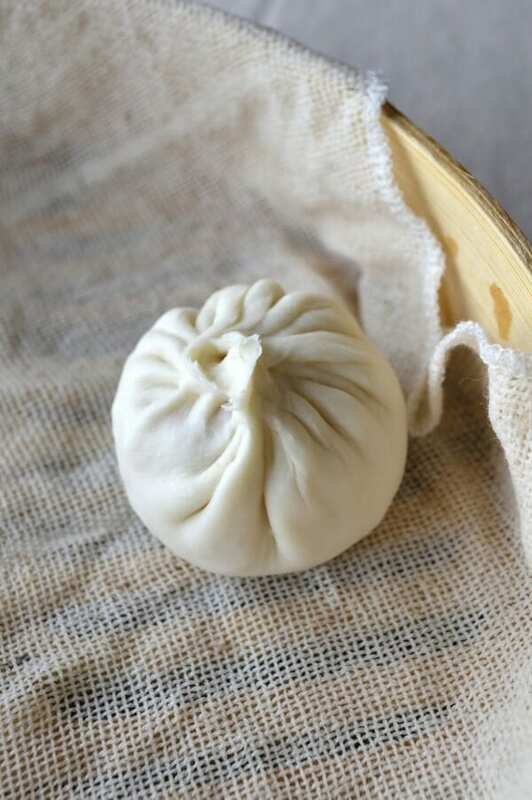 …and take a tiny bite out of the skin on the side of the Xiao long bao bun to make a little hole. Proceed to slurp the soup out of the bun (Carefully. It’s HOT). Then, with a little more vinegar, finish the whole thing off in one bite. Repeat as needed until all of the Shanghai Soup Dumplings are gone! 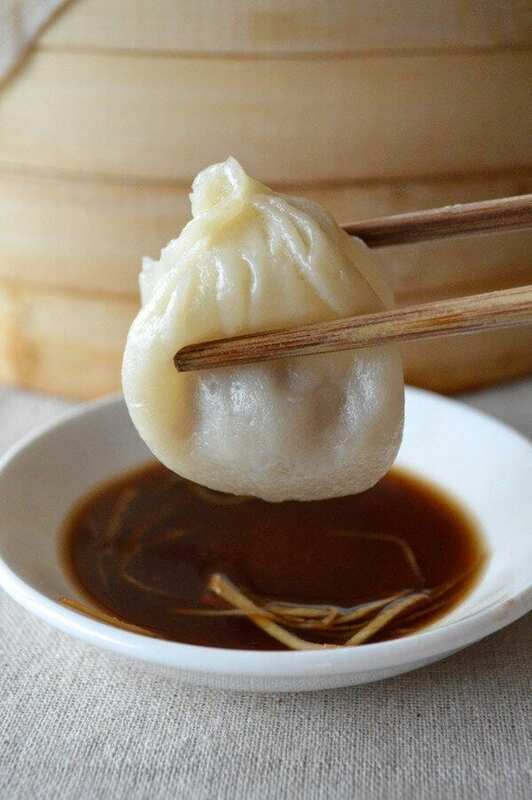 By the way, as if it could get any better, a side benefit of this soup dumpling is that it’s full of collagen from all that pork skin, which is a major skin-booster. Xiaolongbao are delicious AND can help you stay young!?! Come ON! 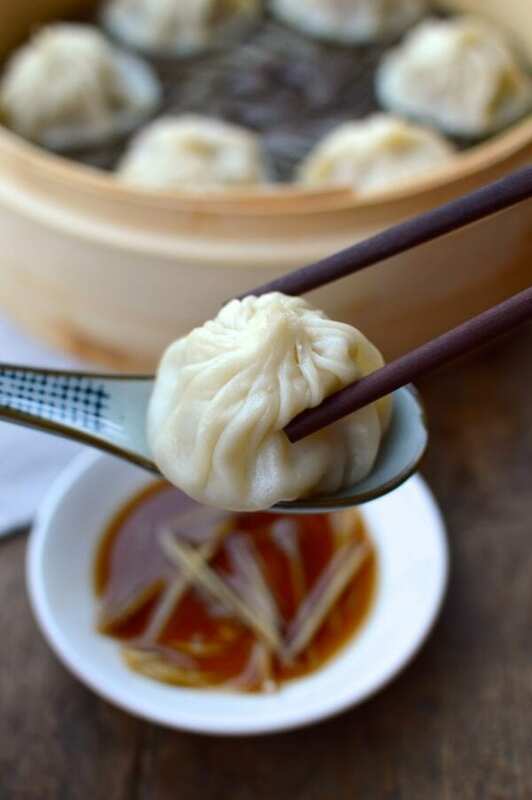 Shanghai Soup Dumplings, or xiaolongbao (小笼包)—perhaps the most perfect single bite of food ever conceived by man—does not require much introduction. 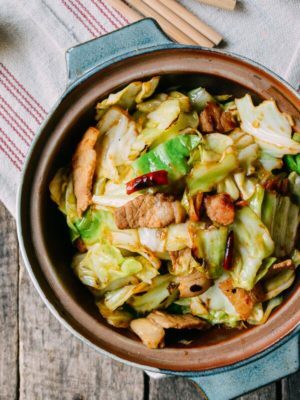 This tantalizing, dreamy snack is probably the most famous dish to come out of Shanghai: paper-thin skin enveloping perfectly seasoned pork filling and rivers of hot, flavorful soup. If you want to make more of these, you can multiply this recipe as needed! It's not really a good idea to freeze these, as they're so delicate. Take your ground pork and put it in the food processor. Pulse for 30-60 seconds until the pork resembles paste. 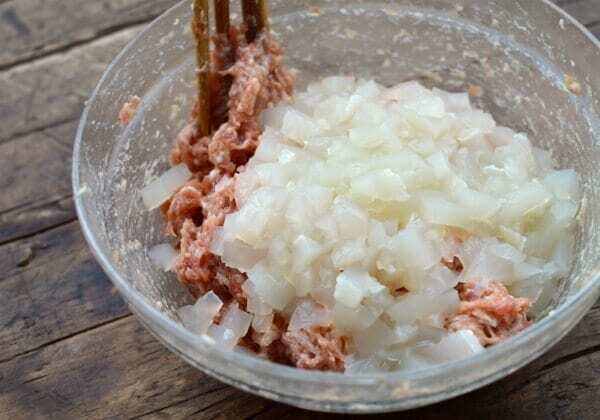 In a mixing bowl, add the pork and all the rest of the ingredients except the aspic. Whip everything together thoroughly, for about 2 minutes. 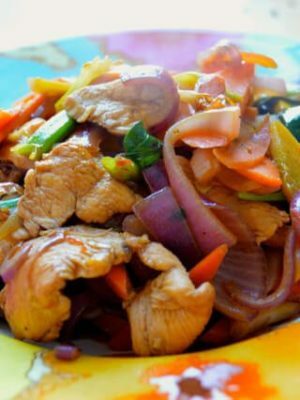 You want everything to be extremely well combined, and the pork should look like a light, airy paste. Gently fold in the aspic, and do not over-mix. Cover and transfer the filling to the refrigerator until ready to make the dumplings. 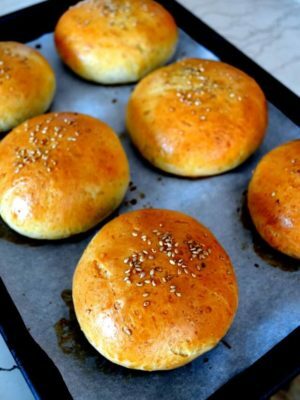 If you’re ready now, you can put it in the freezer for 15 minutes to allow it to firm up and make assembling the buns easier. Lightly dust a clean work surface with flour and roll the dough into a long cylinder/cigar, about an inch in diameter. 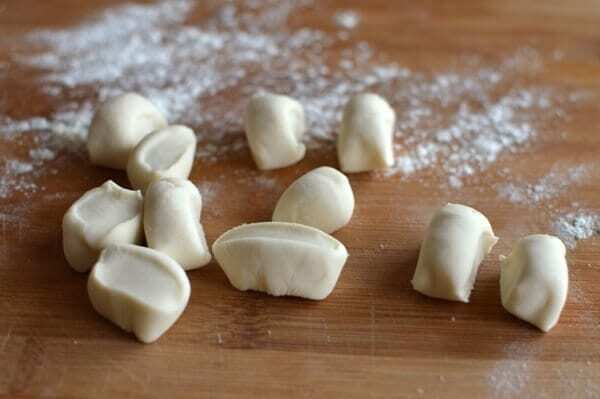 Cut the dough into small equal pieces weighing about 11 grams each (the dough chunks should be a size resembling that of gnocchi). Roll out each piece into a round disc about 3 - 3 ¼ inches diameter. Keep everything under a damp cloth. Prepare your bamboo steamer. 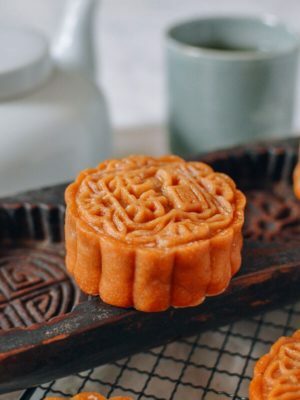 You can line it with cheese cloth, napa cabbage leaves, or these lovely bamboo steamer discs, which can be found in some Chinese restaurant supply stores (if using these, you must brush the discs with oil first!). When all that is prepared, take out the filling. 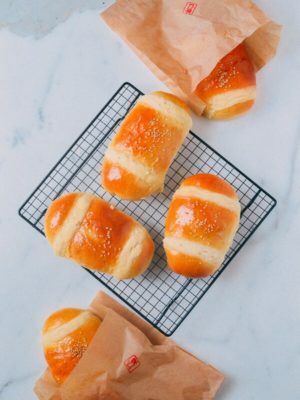 You’ll be making each bun one at a time. Place about 1 tablespoon of filling in the middle of your dumpling skin. Pleat the dumpling as shown in the video. It should have as many folds as you can muster: 12-20 folds should do it. Watch the video in our Carrot Ginger Pork Bun post. The technique is very similar. For this one, you’re just making more folds. Make sure the top is sealed. If the filling ever gets too wet or hard to handle, put it in the freezer for another 15 minutes and start again. Place the buns in the lined steamer basket, about 2 inches apart. In a metal steamer pot or wok, boil water. If using a wok, put the water at a level so that when you put the bamboo steamer into the wok, the water rises about ½ inch up the bottom of the bamboo base. You never want the water to touch the dumplings inside, though, so make sure not to fill it too high! Ok, so there is definitely a proper way to enjoy these dumplings. Put away the soy sauce because it has no place on the table right now. What you want is Chinese black vinegar. Pour some out into a small, round dish or bowl, and top with some very thin matchsticks of ginger. Carefully, slowly peel the xiaolongbao off of the steamer basket and dip it into the vinegar. 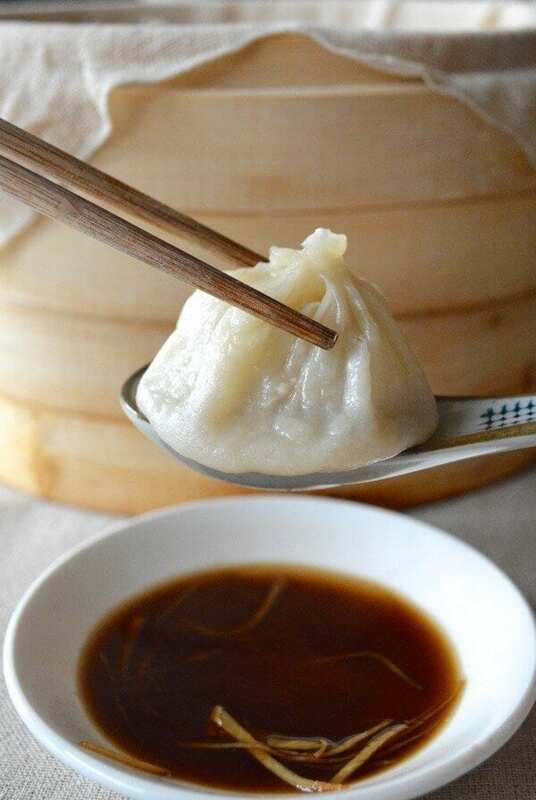 Gently transfer the dumpling to your soupspoon and take a tiny bite out of the skin on the side of the bun to make a little hole. Proceed to slurp the soup out of the bun (Carefully. It’s HOT). Then, with a little more vinegar, finish the whole thing off in one bite. Made these the last two days. Aspic turned out well and DID gelatinize on its own. However I did put it in an air-tight container in the fridge overnight so that might have helped. After reading some of the comments about the soup not appearing, I tried to mix in the aspic in smaller doses to try to get more soup available. However the soup still didn’t really appear in the dumpling after steaming. 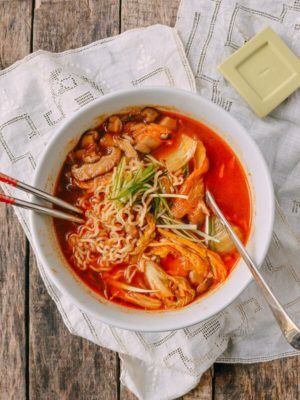 Any notes about how to get the soup to actually stay? I used store-bought dumpling wrappers (Twin Marquis brand) as this was my first time making xiao long bao and didn’t want to mess up- worked out really well and cooked at the same rate. Finally, I added minced mushrooms and scallion into the dumpling mix to give it a little flavor and include something other than just meat. Overall, good recipe but I’d add some small veggies for flavor and I want to figure out why my soup disappears too. Hi Julia, the soup did not disappear, it’s just that when the meat filling is not wet enough, soup will be absorbed by the meat filling. Try adding more water to the meat filling in addition to the aspic. 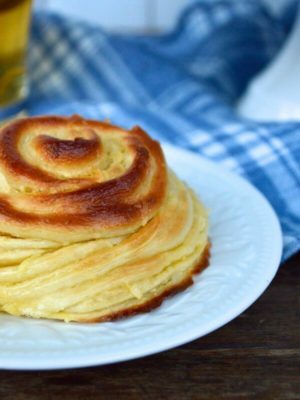 Thanks sooooooooooooo much for this recipe! Having lived two blocks from Chinatown in NYC, my wife and I used to frequent many Shanghai restaurants (Joe’s Shanghai, Shanghai Cafe, etc..) but as a northern European white dude, I have never had the bravery to attempt Xiaolongbao . . . until now. 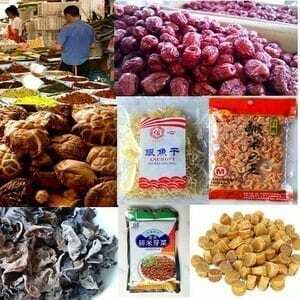 Your recipe distills the essence of these simple yet complex delicacies. I am so totally psyched!!!! Hi Efrat, it’s ok technically, but since I have never tried it, I hesitate to let you proceed. You can prepare the filling (without aspic) the day before. Hi. Thank you for the recipe. 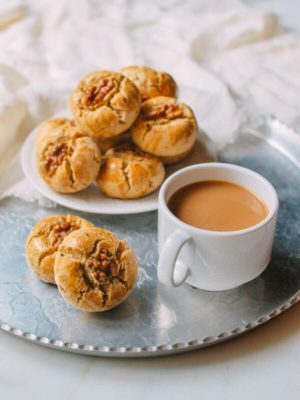 The flavor of the filling is perfect! I am wondering why the skins of my steamed dumplings seem a little thick and tough on the top. I made 18 wrappers from the dough recipe, rolled them out thin, steamed for 8 minutes. but the dumplings skins seem a little dry on the top. (I steamed in my Chinese metal stacking steamer with napa leaves.) Thank you! Hi Jennifer, this dough has no rising agent, so it is slightly tough, especially when cold. I have been trying to make Xiao Long Bao for years…ever since a trip to Shanghai where I was able to have the real deal! A multitude of recipes, but I’ve always been convinced it was the dough. I tried your recipe, and with a minor tweak, I have successfully done it! I had to add fat back to get 30% fat in the ground pork. For the aspic, I left it covered for hours before removing the lid and letting it reduce down to about 1 cup. This firmed up well in the fridge. Also, I think my previous failures were the dough absorbing the broth, so I substituted 1/4 of the water in the dough with oil. This seemed to work! Sounds great, Jeff! Kudos to your success! Judy. Thanks for this recipe which solves a mystery that I’ve pondered over since my first soup dumpling in NY 10 years ago. I’ve now made it twice. 1) My aspic never gelled. I left it in the refrigerator overnight and all of the next day and only had a small amount gel, the rest remained soup. 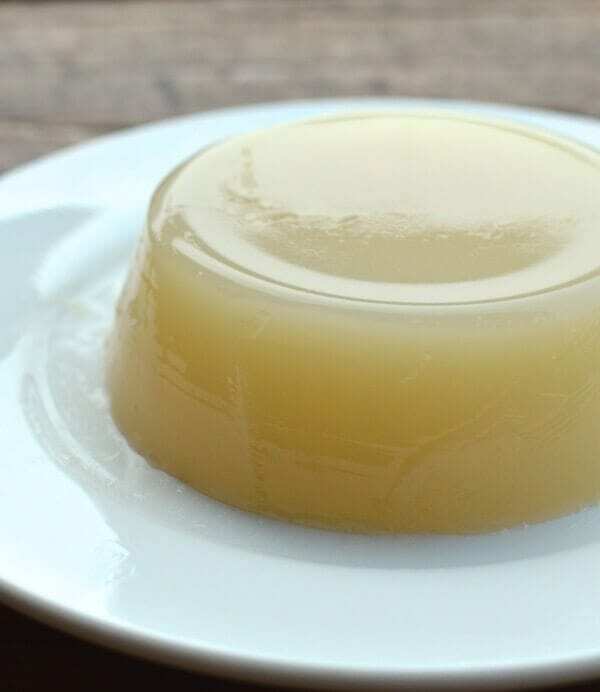 I added 1/2 tsp of knox gelatin and again left it overnight and it was– “ta da” –ASPIC. 2) I’ve made the dumplings with both a thicker and thinner skin. I think the thin skin was more prone to let the soup leak out during steaming. It was heartbreaking to see my wonderful soup floating atop the water I used to steam them. If you have any thoughts of the most successful way to retain the soup inside the dumpling, please let me know. I’ve crimped the top and the dumplings did not leak before being steamed. Those that didn’t leak were perfect. 3) We couldn’t eat them all the first day. I refrigerated the spiced pork and the aspic. I made fresh dough. They came out great. Thanks again. These were every bit as good as the ones we eat when we have the chance to go to Manhattan (we live in the mountain west so Chinese food is not that easy to come by). What a treat. We made dumplings that tasted exactly like the ones we get when we go to Manhattan. This is 5*! Thanks for the tip. The devil is in the details right? So glad I found this website. 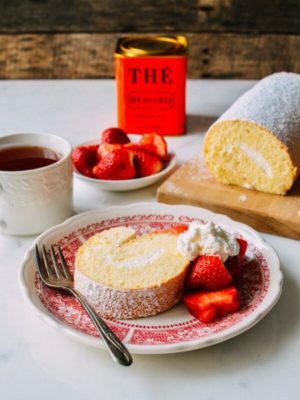 Been looking for this recipe. Hello. Thank you for the recipe. I have a problem though, i lost all the soup inside the dumpling and all that remained is the meat filling. I placed the dumpling in a small bowl inside the steamer but the bowl is dry. I was wondering where the soup went? Hi John, LOL, you are too funny. I want to know at what stage did you find that soup was “gone?” Maybe there was not enough aspic or filling in general. The aspic is chilling. It’s still pretty loose, but I’m hoping it will be more solid by morning. My son, whose favorite food in the whole world is Xiao Loong Bao will be helping with the folding and steaming tomorrow. We’re transplants from Los Angeles, wtih family roots in Toronto and Hong Kong. For the past 4 years, we’ve been living in Swaziland, in southern Africa. 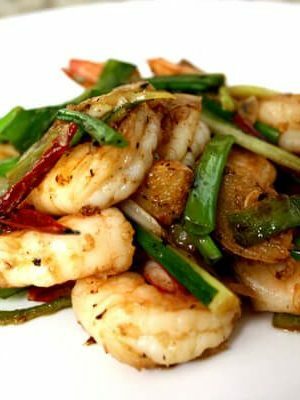 We love our life here, but long for our beloved Chinese food. 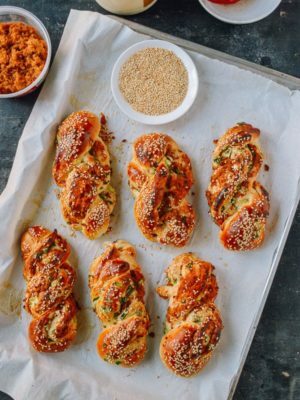 This longing has driven us to make our own roast pork, sesame crusted “siu beng” breads, rice noodle “cheung fun”…the list goes on. 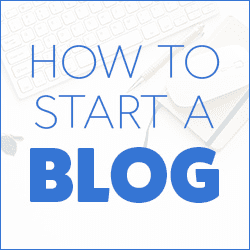 Thank goodness for your wonderful blog. It has never steered me wrong yet! Thank you for your heartwarming comments, Frances! 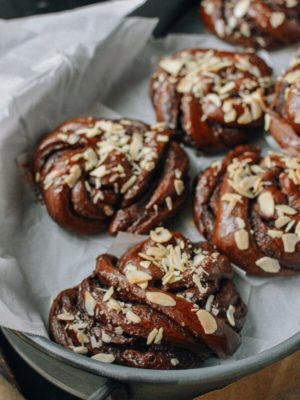 How did the buns turn out? I’m making this as we speak, however I’ve a question I’m hoping you can help me with. I’ve simmered the pork parts with the ingredients as instructed, but by the time 2 hours are gone I’m left with what seems like very little soup. 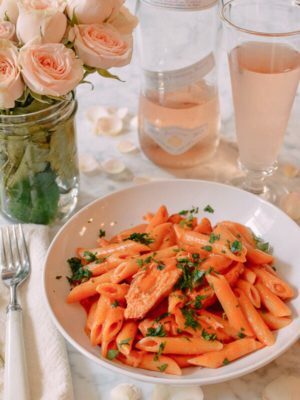 It’s not necessary to add a bit of water as you go through the simmering? Also, the actual flavour of the dumpling comes soup or filling or both? The soup itself seems a bit dull now. Awaiting your soonest reply (I’m refrigerating the soup tonight). 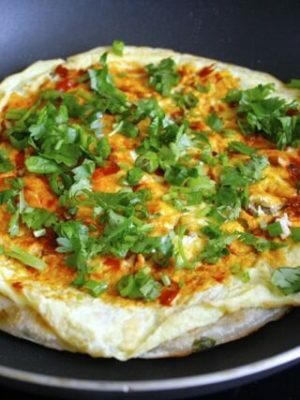 Thank you for all your efforts in creating this highly appreciated (mainly by my Chinese wife) blog! So we made the dumplings today and here are my findings. There was indeed not enough jello. Added to that evenly distributing the jello across all dumplings is a challenge. I wonder, could you add the filling to the soup when almost cool, mix, refrigerate overnight to establish more even mixing? The filling was a bit dry also, should’ve added water after overnight chilling maybe? Flavor. Even though I kept to your measurements the final flavor was still a bit bland. Maybe add a chicken/port stock tablet to the soup next time? We used ready made jiaozi wrappers. Upon steaming them they do go a bit dry on the outside. I noticed a similar thing before when steaming jiaozi instead of boiling. 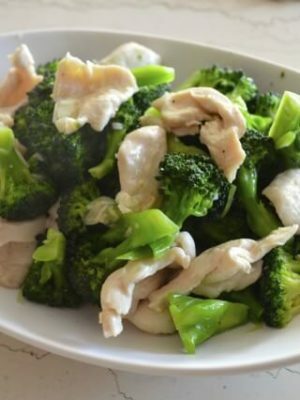 Thank you for a wonderful recipe, I’ll be building my own on it and do appreciate any comments you have on the above. Hi Lawrence, I too wonder the same thing, and I think you have a good solution. I will have to try it next time. Thank you so much for the tip––have you tried out your theory yet? How did it turn out?